the Latty congregation was moved to St. Joseph’s; 2) in 1918 a parochial school was established and staffed by the Sisters of St. Francis of Tiffin; the school had to close in 1930 because of financial restraints brought about by the Great Depression; 3) on December 13, 1925 at 8:30 on Sunday morning fire was discovered in the frame building of the old St. Joseph’s Church. In two hours the entire church was lost. In a little over a year a new church was build at a cost of $53, 060.95. The first Mass was celebrated in the present church on Christmas Eve 1926. 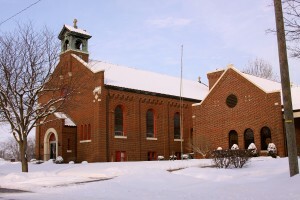 At the end of 2007, St. Joseph’s was a vital parish with over 1,200 registered members, an Education Center, prayer garden, rectory, Garden House and a newly renovated church. From humble beginnings the Catholic faith has grown in this area of the once Black Swamp through the faith of the people and the grace of God. July 1, 2008 the parish was suppressed and Divine Mercy Catholic Parish of Paulding County was established. The history of this new parish is just beginning to be written, but the faith of the Catholic people remains.